Taxes affect everyone, with the poor seeing a greater ratio of their salary affected by taxes. The annual tax is expected to generate about $1.2 million USD. 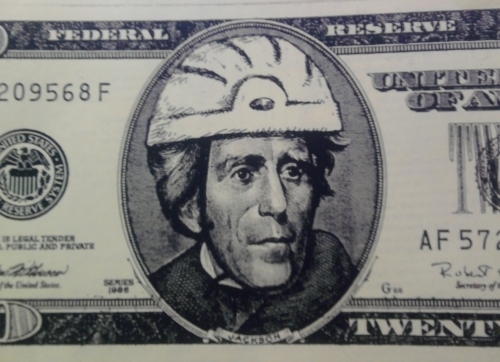 This won’t pay for much using today’s NACTO design standards. Many business owners, advocacy groups and voters are against this bill (now Law). The Secretary (of the Interior) determines how much to give to each state based on a formula that takes into account both the area of the state and its number of licensed hunters. States must fulfill certain requirements to use the money apportioned to them. None of the money from their hunting license sales may be used by anyone other than the states’s fish and game department. Plans for what to do with the money must be submitted to and approved by the Secretary of the Interior. Acceptable options include research, surveys, management of wildlife and/or habitat, and acquisition or lease of land. Once a plan has been approved, the state must pay the full cost and is later reimbursed for up to 75% of that cost through PR funds. The 25% of the cost that the state must pay generally comes from its hunting license sales. If, for whatever reason, any of the federal money does not get spent, after two years that money is then reallocated to the Migratory Bird Conservation Act. The Secretary (of Transportation) determines how much to give to each state based on a formula that takes into account both the area of the state and its number of cyclists. The photo shows an increase in hunting days since 1930. As a hunter, I know you can’t hunt what isn’t there. PR Conservation dollars paid to improve habitat and, thus hunting opportunity. For example, In 1937, Missouri’s deer season was only three days long, and harvested 108 deer. 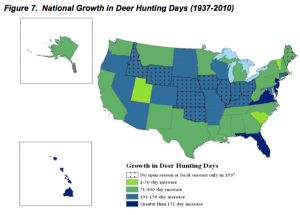 Today hunters in Missouri can hunt deer for 123 days (a 4000% increase) During 2009, Missouri hunters took almost 300,000 deer. As a cyclist, I can imagine how a paltry (by comparison) 200% increase in cycling infrastructure would improve the cycling network and opportunity here in Tempe. Many may say, that will never work for cycling, we already pay taxes and our mode of transport is less hard on roadways (maintenance). I’d say you are full of it because you don’t understand perception: Drivers believe that, in general, their tax money should benefit them, because they pay a tax and establish the funding. The result is that little money is spent on things that do not improve motoring opportunities. How do cyclists counter this perception that they don’t pay – you got it! By establishing a dedicated tax to pay for their infrastructure and immediately and forever dispel the myth that cyclists are freeloaders. I thinking of purchasing a new bike soon – the bike I like will cost well over $2000. If I had to pay an extra $15 (a 0.0075% tax on $2K) – knowing that this money went to pay for improvements around cycling opportunities – I’d be ecstatic. I’d buy a $200 dollar helmet knowing that 11% of that purchase ($22) would stay local to pay for bike lanes and the like. Shoot! I’d buy local knowing that my new tires fund the bike lane I am riding on. And guess what, I’d also be 100% demanding that money to be used for what it was intended. Instead of fighting for transportation dollar scraps, I’d have the most powerful argument available: “because I paid for it out of my taxes”. And here’s the beautiful twist; unlike auto users, cyclists could point to a specific tax, singled out to pay for the stuff we want. Drivers simply could not do this because fuel, license and registration fees account for, at most, 50% of the cost of building and maintaining roads. I’ve long thought that the cycling industry should employ the strategies and tactics that the hunting and firearm industries use. This is a simple persuasion play using their exact tactics – we pay for our own stuff and thus we deserve it. This is so powerful that it cannot be outflanked and there is no city department or politician who can say you don’t get use your ear marked tax dollars. It was so successfully in the hunting industry that, 13 years after it was passed, a similar law was passed to benefit fishing and the fishing industry begged for it to pass! The cycling industry can lead the way here. However, it will take a leadership change along with advocates who understand that most of the arguments against cycling are based on perception. Instituting a C-PR type bill would immediately swing the tide in transportation funding and wipe out the largest perception: Cyclists don’t pay their way. The recent tax on bikes in Portland has immediately put the cycling community on the same plane as motorists. Some say the the tax was instituted as a punitive measure by non-cyclist groups intended to punish cyclists – even it it is, it was a grave tactical error. We’ll soon see whether the business owners and advocates in PDX embrace their new found power or continue to look this gift horse in the mouth.